The brief of this project was to find alternative uses for the screens that have been recently installed in London buses. Currently these screens usually display live CCTV footage and advertisement. 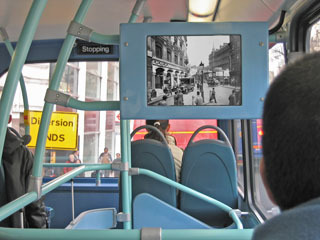 The screens constitute a great exhibition space for historical material of the locations that the buses pass. There are several institutions in London like the Museum Of London, the British Library and the London Transport Museum that have vast archives of images and film footage on the subject of London. We therefore propose the display of a sequence of historical images that relate to the changing geographical positions of the buses. These sequences of images are rendered in real time, whereby their order is dependent on GPS, speed and acceleration information gathered from the bus. With its dynamic editing of historical material this concept does not only target tourists but also the regular commuter as audiences. We believe that the juxtaposition of images from different epochs and periods heightens the awareness of the locations that we often pass through with disinterest. We also think that this concept may relativize the immediate and closed experience of CCTV with an expanded geographical and historical experience.